I haven't posted in a while due to two big customer projects that have absorbed my time. 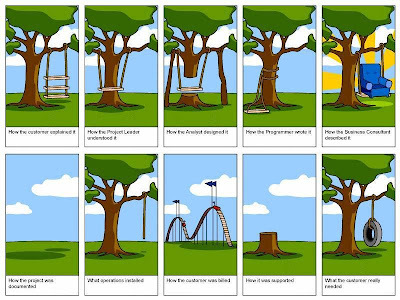 Although both went well in the end, anyone who has worked on software projects from start to finish will appreciate this cartoon, which has been passed around so much I don't know who to give credit to for it. Another day I'll write several pages about the process of developing specific features for one client within a Web application, but I'll leave it at this for now. Thanks to Nina Govan for sending me an excellent article from Tim O'Reilly in 2005, "What is Web 2.0?" The term is so over-used that I had forgotten that it was created as a well-considered definition of the post-dot-com era. If you don't have time to read 5 pages, here are two parts that really stuck out in my mind. "If Netscape was the standard bearer for Web 1.0, Google is most certainly the standard bearer for Web 2.0, if only because their respective IPOs were defining events for each era. So let's start with a comparison of these two companies and their positioning. Google, by contrast, began its life as a native web application, never sold or packaged, but delivered as a service, with customers paying, directly or indirectly, for the use of that service. None of the trappings of the old software industry are present. No scheduled software releases, just continuous improvement. No licensing or sale, just usage. No porting to different platforms so that customers can run the software on their own equipment, just a massively scalable collection of commodity PCs running open source operating systems plus homegrown applications and utilities that no one outside the company ever gets to see." "In the internet era, one can already see a number of cases where control over the database has led to market control and outsized financial returns. The monopoly on domain name registry initially granted by government fiat to Network Solutions (later purchased by Verisign) was one of the first great moneymakers of the internet. While we've argued that business advantage via controlling software APIs is much more difficult in the age of the internet, control of key data sources is not, especially if those data sources are expensive to create or amenable to increasing returns via network effects. Look at the copyright notices at the base of every map served by MapQuest, maps.yahoo.com, maps.msn.com, or maps.google.com, and you'll see the line "Maps copyright NavTeq, TeleAtlas," or with the new satellite imagery services, "Images copyright Digital Globe." These companies made substantial investments in their databases (NavTeq alone reportedly invested $750 million to build their database of street addresses and directions. Digital Globe spent $500 million to launch their own satellite to improve on government-supplied imagery.) NavTeq has gone so far as to imitate Intel's familiar Intel Inside logo: Cars with navigation systems bear the imprint, "NavTeq Onboard." Data is indeed the Intel Inside of these applications, a sole source component in systems whose software infrastructure is largely open source or otherwise commodified. The now hotly contested web mapping arena demonstrates how a failure to understand the importance of owning an application's core data will eventually undercut its competitive position. MapQuest pioneered the web mapping category in 1995, yet when Yahoo!, and then Microsoft, and most recently Google, decided to enter the market, they were easily able to offer a competing application simply by licensing the same data. Contrast, however, the position of Amazon.com. Like competitors such as Barnesandnoble.com, its original database came from ISBN registry provider R.R. Bowker. But unlike MapQuest, Amazon relentlessly enhanced the data, adding publisher-supplied data such as cover images, table of contents, index, and sample material. Even more importantly, they harnessed their users to annotate the data, such that after ten years, Amazon, not Bowker, is the primary source for bibliographic data on books, a reference source for scholars and librarians as well as consumers. Amazon also introduced their own proprietary identifier, the ASIN, which corresponds to the ISBN where one is present, and creates an equivalent namespace for products without one. Effectively, Amazon "embraced and extended" their data suppliers. Imagine if MapQuest had done the same thing, harnessing their users to annotate maps and directions, adding layers of value. It would have been much more difficult for competitors to enter the market just by licensing the base data."